The 1970's vibes with flared jeans. So the recap of Riga Fashion Week is officially over. All the reviews went live throughout the past seven days. All thoughts and impressions were translated to digital paper and will remain here, so you can easily search though the website to browse and read any of them. Still one review-story remained untouched yet, but it will go live around next week. To give you a clue, it will be about lingerie and swimwear presentation that took place in terms of Riga Fashion Week. Meanwhile, it's a new week and it's about time we had a look at my outfits from the fashion week. Happened so that most of my outfits came as an inspiration I got from the Trend Reports we had just before the RFW kicked off. It means that here or there we will be able to have a look on how some of the season's coolest trends can be applied in real life. So let's start with the very first outfit I had for the opening runway show. As other four outfits were thought through at least a week before, this one came the very last moment. It all started with Tommy Hilfiger flared jeans. Now, seriously, you need to try flares this season. It turns you into a combination of female characters of the 'That 70's Show' and Victoria Beckham. Such a synergy of retro and modernity. My combination is a pure 1970's style. Flared jeans, turtleneck and heeled ankle boots. 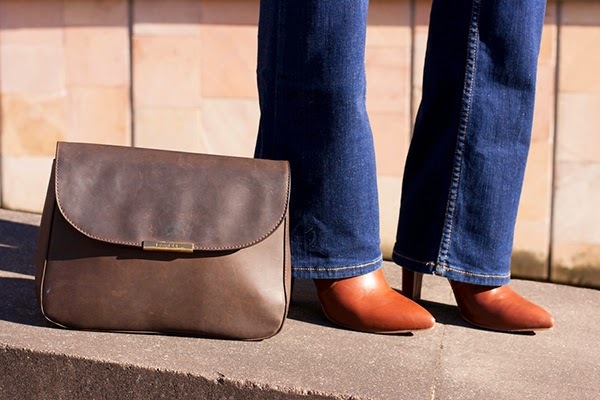 If you remember, weeks ago I did drop you a hint about the brown colored pair of Centro booties. So here we go, it happened to be a perfect match for this 70's inspired outfit. Look that was based on blue and from-beige-to-brown color combination got a little bold touch with an orange poncho coat involved. As it's still impossible to get by without outerwear, poncho wrapped up this 'retro meets today' inspired look. As I stated it above, the look was taken by me for the opening show of Riga Fashion Week Autumn/Winter session. It was the presentation of Latvian label QooQoo 'Wild Child' collection that took place at D.Fab and was supported by MNTHA's live performance. Read more about QooQoo's AW15 collection presentation HERE.